Staining wood is one step in what is known as 'finishing'. Most wooden items need a coating of one form or another to protect its surface and add to its aesthetic appeal. There are of course occasions when a woodworker might choose not to finish a particularly beautiful wood but that is an exception rather than the rule. For most projects, finishing is a necessary and crucial step. For a properly finished piece often looks far more appealing and exciting than unfinished wood. Finishing can of course be of various kinds depending on the material used, the use of the item and the woodworker’s personal preferences. Plywood, for instance, requires very different kind of treatment from natural wood; MDF, particle board and other man-made material again have their own imperatives. Some projects call for colour treatment; others are best finished with a few coats of latex or plastic paints while some call for careful staining to preserve the grain of the wood that is to be shown off. In this post we will only try to find out how to apply stain over natural wood. The problem in India is that most manufacturers do not provide much information about their products, especially when it comes to stains. There are various kinds of stains and perhaps the most important is what kind of solvent the pigment or dye is mixed in. The solvent or base could be water, alcohol or some type of oil. The different bases do not mix, their properties are somewhat different and often the choice of a protective finish will depend on the stain type. Another very important distinction is between pigments and dyes. 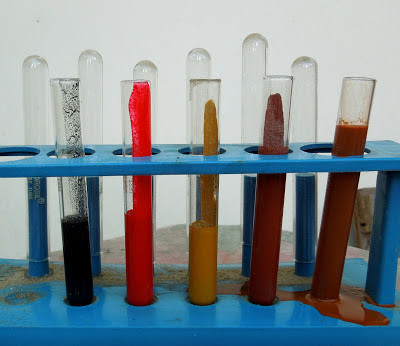 Pigments are very fine but insoluble particles of coloured material suspended in a vehicle (water or alcohol usually) while dyes are made of particles that dissolve in a solvent (again water, alcohol and so on). Dyes being finer penetrate deep into the pores of the wood while pigments only coat the surface. Dyes are better at bringing out the grain of the wood but are difficult or impossible to remove. A pigmented surface, on the other hand, can usually be sanded and re-done. Both pigments and dyes are thus dissolved in some form in a solvent. Commercial stains also contain a 'binder' for improved adhesion to the substrate. The strength of the stain to be applied can be controlled by thinning the solvent but it is important to know whether the stain is water, oil or alcohol based. 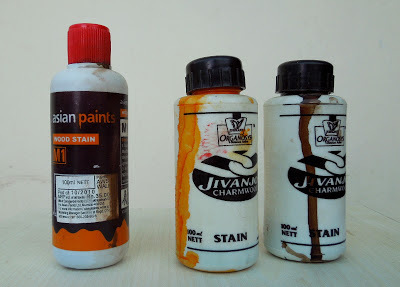 Indian manufacturers do not unfortunately mention what their stain base is. Therefore a little experimentation is called for. Most manufacturers also produce what are called “universal stains” and a number of shopkeepers told me that these are wood stains. I trusted their advice but when I tried these “universal stains” I found they were muddy, opaque and totally unsuitable for staining wood. I suspect these are mainly for tinting wall paint, latex paints, enamel paints, cement, plaster of Paris and so on. They are totally unsuitable for use on wood. A good stain in my view should be translucent and not opaque or else the wood grain will be totally obscured. There are of course occasions when it would be desirable to totally cover the wood as when the aim is to make the wood to look like ebony. But this is an exception. Normally, a stain is applied to bring out the beauty of the wood and not suppress it. Sadly, I have found a lot of wood stains produced in India to be fairly opaque and thick with pigment. I decided some time ago to go with a fairly good quality American made stain called Varathane available easily in many paint shops in India. 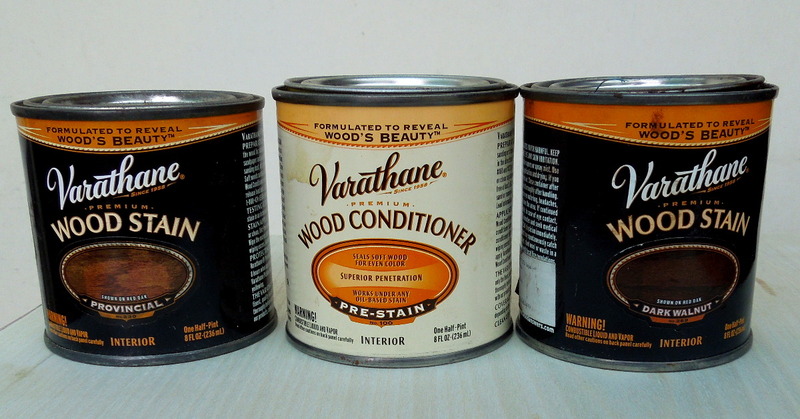 Varathane is made by a US company and comes in a range of very rich tints. Each half pint can is priced at Rs 165 in Delhi. This is an oil based stain and can be used together with a wood conditioner to prevent blotchy staining. The wood conditioner is applied to the wood after sanding and once thoroughly dry, the stain is applied. This stain can be applied easily with a piece of cotton rag and is consistent. Being oil based stain, the can’s contents must be thoroughly stirred before use. A number of India manufacturers also make stains of varying quality and can be used after testing them on scrap wood to see how they stain. Most Indian wood stains seem to be alcohol based which makes them easy to dilute to the required consistency. The other advantage is that Indian stains are cheap – usually less than Rs 50 for 100 ml. Over the next few weeks, I will experiment with various commercially available stains from the better known Indian manufacturers and report my findings. Recently, I purchased some alcohol based dyes from old Delhi’s famous Khari Baoli market. These are very powerful dyes and the powder is so fine that the slightest breeze will blow them into the air. I was careless and a bit of this powder blew into my face and marked it purple! It took me a lot of effort to get it off and even then it took days to clear. I have yet to try them out. Stain can be applied over wood in a number of ways, a clean cotton rag being the easiest. Stain is meant to be applied liberally and after about two minutes or so wiped off. If the desired change in colour is not achieved after the first application, another coat could be applied but ideally the first wipe should do the job. The protective layer (Shellac, Polyurethane, lacquer or whatever) should be applied only after the stain is thoroughly dry, preferably overnight. The important thing is to see how the stain is affecting the wood. The photo above shows the application of an opaque stain on plywood. The stain completely suppresses the pattern of the wood below. This is not desirable in most cases. 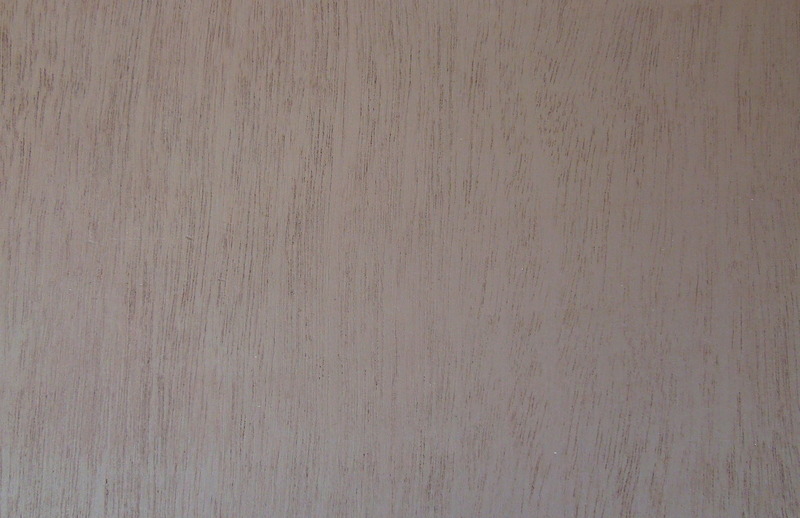 This is an example of a good stain as the wood grain is clearly visible. 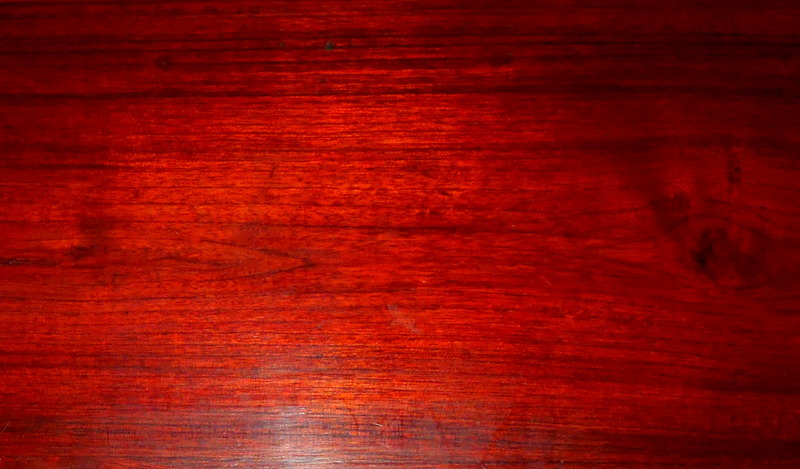 The cabernet stain has added lustre to the wood surface and enhanced its natural beauty. This is the kind of staining that I prefer. Staining is a vast subject and quite an art in itself. Tomes have been written about it and the sheer amount of advice can be intimidating. The best approach is to have fun with staining; try out different stains and combinations and see how they work for you. More on this soon. You almost seem to have read my mind. For the last few weeks I have been thinking exactly along these lines. I thought instead of experimenting with questionable finishes I should get brands that I am familiar with. Especially where grain needs to be there are not too many choices available in India mainly because not many craftsmen use transparent finishes. I have one generic question. What should be used to thin the stain or metallic paints. A thinner or what shops call as turpen. Also the Fevicol used to stick would, can that be thinned? Thinners vary according to the type of stain depending, as I explained in the blog, on the type of base or solvent. I do not know anything about metallic paints but the typical enamel or synthetic paints are thinned usually by turpentine or "turp" as it may be called locally. As for Fevicol adhesives, there are many kinds. The most commonly used wood glue is the white or PVA glue. This can be thinned by water. @Joseph: thinner is meant for metal paints and retarder is used for stains or wood finishes. some people say that both these liquids are nothing but turpentine oil. Regarding thinner and turpentine : Mineral turpentine is petrochemical based. It evaporates slowly. Thinner is an organic solvent. It evaporates very fast, containing often chemicals like acetone etc. I am more careful when I use thinner as many of these organic solvents are harmful, and for the likes of me I have no idea what solvent goes into "thinners" available in India. Turpentine I think is safer. Usually the diluting agent is mentioned on the tin of paint. You may need to look at a half liter or one liter tin for that as the smaller ones may not have all the instructions. I have painted a chair (spray painted) and I now wish to give it an antique finish. Most people suggest using a faux glaze (which is not available in India). Would you be able to tell me an alternate to achieve the antique finish or if faux glaze is available in India? Anonymous : This is the most toughest situation in India. Professional Painters, will use very very rudimentary methods, or dark secrets towards their work. They will not disclose about their process, and all of them have their own biased approach towards what is right and wrong way of doing things. Also, the language terms they use in their local places are also all so different. Welcome to the world of Unity in Diversity. Paint Companies, will not disclose much either or explain how their stuff will/should be used. Look at the Asian Paints website, what a Pure Joke it is. More of a Slideshow than being any informative. Or you would have to struggle till eternity to find details. Bloggers would not answer to queries, because, their knowledge is also severely limited. Try searching for a Glaze Paint India in google, and you will hit stuff being sold in Ebay :) Ridiculous, if you would need to use Ebay for stuff like this, then you are doomed. So Basically you are are on your own. See for eg. Your question posted almost an year back, has no response yet. I tried, Looking myself for how to Make MDF speakers look good, and then came across the Faux Techniques of Painting on wood. Got a Local Painter, to achieve somewhat similar kind of effect, however, no where near. Basically, the Glaze is a kind of medium, that is kind of a transparent/semi transparent viscous Fluid. SO basically, when you apply it on top a printed surface, it forms a layer(coat) on top of the printed later, but keeps the content of the printed surface visible . Also, the glaze, is a little slower drying fluid, which dries off little late allowing you working time for a few minutes before it dries up and settles, So you can Mix a transparent Tint(transparent wood stain most probably) to it, put a layer on top of the surface you want painted, and then using cloth or brushes or even fingers, vary the amount of the fluid along the surface at different places, and get patterns of choice. I think that is what it is, but I am still unclear, where you get this Glazing Medium, I am no way fond of spending INR 3K to buy it from Ebay. There has to be something locally available off the shelf. My local Painter has no clue about it, and says, you can use Sanding Sealer as the medium. Most likely that should work, but I am still in experimental stages to verify that. I will post update when I do find out more on it. Today, more and more stuff is built on MDF and Particle Boards. So we need more articles on MDF/Particle board Treatments than Pure Wood, since wood is becoming so much more affordable. Thanks for an excellent comment. Could not agree with you more. I too have been searching for glazes but so far have not come across anything. One company is planning to market them in India. If they do I will let you know. Do update on this issue when you find out more.